At 113 years old, Dolly Gibb offers advice for a long and happy life. Dolly Gibb is Canada’s oldest known citizen. Born Ellen Box in 1905 in Winnipeg, she got the nickname Dolly when, as a teen, she worked at Eaton’s creating women’s accessories. Unfortunately, she had to quit when she got married because the department store didn’t employ married women in 1928. Beyond advances in women’s rights and extraordinary leaps in technology, Dolly has experienced the leadership of 17 prime ministers. Her favourite? It used to be Pierre Trudeau but not anymore. “I like the new one—Justin,” she laughs. Widowed in her 60s, Dolly had two daughters, one of whom she has also outlived by 25 years. 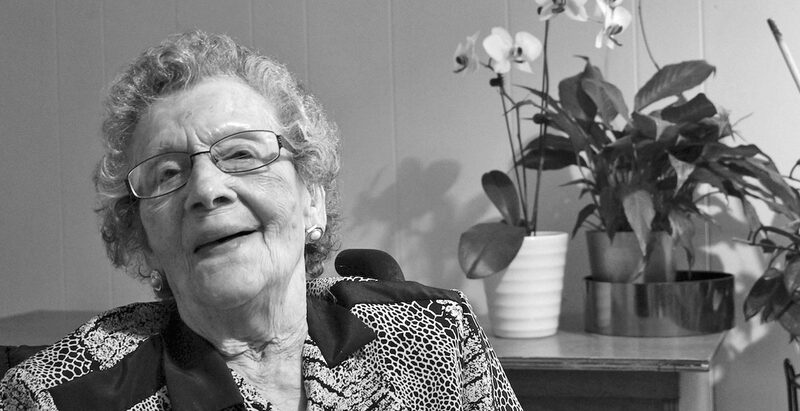 Dolly lived alone at home in Thunder Bay, Ont., until her 100th birthday, then moved “south” to North Bay, Ont., and, now, with the help of family, friends and caregivers, she lives with her daughter, Sue Crozier, who kindly facilitated our chat. Put up a fuss for what you think is right. Fight back. What advice would you give your 115-year-old self? I guess keep doing what I’m doing. I’m lucky at my age to be living at home. To be with Sue. Reading, having hobbies and walking a lot was always good for me. I can’t do too much anymore, but my advice to new seniors is to stay busy. What was the best advice you’ve had? Do things you enjoy. Have fun. Yes. I like to gamble. I bought a lottery ticket and won so I took my son-in-law, his mom and my two daughters to Atlantic City to the casino so we could gamble more. What are some of the things you enjoy? My game shows. And my list of appointments and visits. It’s full. Becoming a mother. I remember making little outfits for my girls. I used so many ribbons. Being here now, at home. And having you visit! A version of this article appeared in the October 2016 issue with the headline, “Wisdom of the Ages,” p. 39.